After all, what better illustration of volcanic power than the mountain whose May 1980 eruption blasted a vast expanse of landscape, destroyed or damaged hundreds of homes, choked daily activity in the Pacific Northwest with a dense cloud of ash and left 57 people dead or missing? But Creasy’s plan was even better than he knew. On Sept. 23, about a month before the seminar expedition, the mountain rumbled to life again, emitting steam, ash and fresh magma flows that amassed in the 1980 crater. It was still cooking, if more quietly, on Oct. 20 when the 18-member Bates team began its five-day field trip. “We were working with scientists who were doing research as it really happens in the field, and the kids were able to see that,” adds Laura Kling Lovely ’76, who teaches middle-school math and science in Marblehead, Mass., and came along as an assistant trip leader (as did Assistant Professor Beverly Johnson, a departmental colleague of Creasy’s). In the bigger picture, Creasy says, the reaction to the volcano’s current activity offered an object lesson in human adaptiveness. The 1980 eruption, he says, caught the mountain’s stakeholders off guard and largely unprepared. “But as a result they put into place a lot of protocols should something like this happen again,” he explains. In any case, if the Bates team couldn’t get as close to the mountain as Creasy had hoped, they nevertheless saw plenty of evidence of the 1980 disaster. 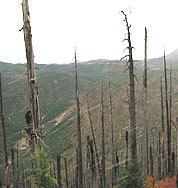 Even 24 years later, and with new vegetation and wildlife returning, it’s a stark terrain of mud, rock and ash deposits, obliterated watercourses, and scorched and toppled trees. “It was really overwhelming,” Kimball says. 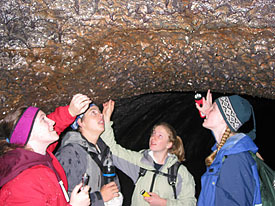 In addition, the group visited other research and interpretive centers around the volcano and worked in a side trip to Multnomah Falls, on the Columbia River in Oregon, to see a cross-section of hardened lava deposits millions of years old. Cold, dark, wet, rough to walk through and provoking to the claustrophobic, Ape Cave was naturally a hit. “Just to be able to walk through that, and get an idea of just the sheer size of it and how much lava was flowing through there, really helped to put everything into perspective,” Kimball says. 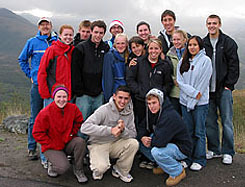 Another high point had little to do with volcanology, but did address a common goal for first-years: “The whole value of the trip was the relationships we formed as a group,” as one student told Creasy.